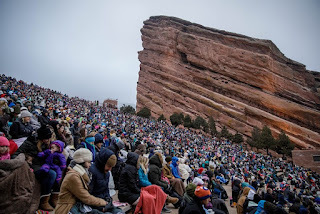 Each year, Denver film lovers look forward to the annual Film on the Rocks screenings, when the Denver Film Society takes over Red Rocks Amphitheater to show cult classics, indie hits and blockbusters alike. This year's lineup includes recent mega-hits Black Panther and Star Wars: The Last Jedi (which was directed by Denver's own Rian Johnson), as well as Heathers, The Big Lebowski, Goonies, Happy Gilmore and The Grand Budapest Hotel. "Denver Film Society continues to celebrate not only the best of film, but also the fun of film with this year's Film on the Rocks series," said Denver Film Festival director Britta Erickson in a statement announcing the lineup. "Kicking off with Star Wars: The Last Jedi, directed by Denver's home-grown talent in Rian Johnson, is the perfect way to take audiences on exciting adventures in the most scenic of places." The full list of those acts will be available when tickets go on sale. General admission tickets to each evening are $15 and will be available starting Friday, April 20, at the Denver Film Society website. So get your tickets and who knows, maybe you will see a member of Rocket House Pictures there so we can watch some films together.